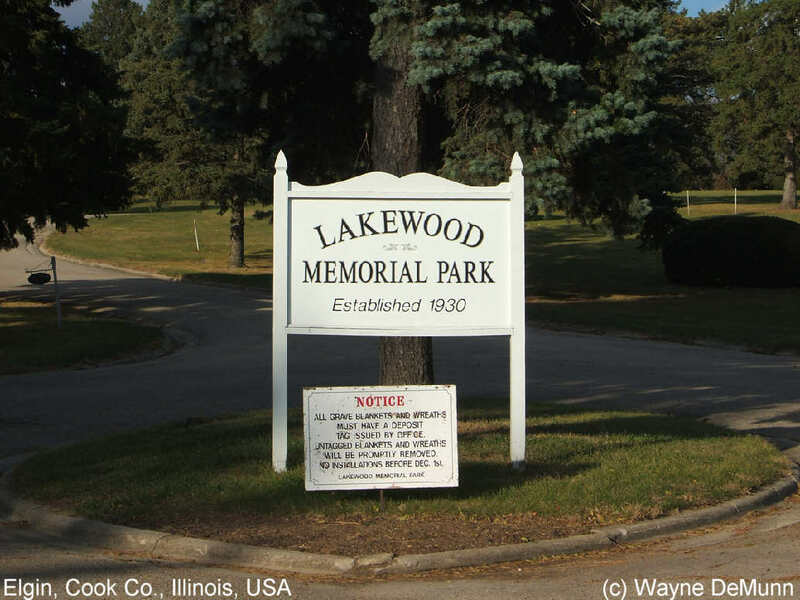 Established in 1930, Lakewood Memorial Park consists of 100 wooded acres. Lakewood has been privately owned and operated since 1981 by the same, family-owned company and has been carefully maintained, professionally staffed, and financially solid ever since. The entrance and office are located at 30W730 U.S. Hwy. 20, Elgin, Illinois. The cemetery is open during daylight hours, and the office is open Mon-Fri from 8:30 to 4:30 and from 9:00 to 1:00 on Sat. Please contact the cemetery for plot and section numbers in order to make a photo request, as this cemetery has reportedly not been very cooperative with photo volunteers.